A NASA solar sail has unexpectedly ejected from its mothership — more than a month late — and is flying free above Earth, and the space agency is hoping amateur radio operators will help track it. NASA's NanoSail-D satellite was supposed to eject from its mothership, a satellite called FASTSAT, back on Dec. 6. But that apparently didn't happen. Now, analysis of FASTSAT telemetry by engineers at NASA's Marshall Space Flight Center in Alabama indicates that NanoSail-D has popped free on its own, the space agency announced today (Jan. 19). Ground-based satellite-tracking efforts confirmed the ejection, NASA officials said. "We knew that the door opened and it was possible that NanoSail-D could eject on its own," Mark Boudreaux, FASTSAT project manager at Marshall, said in a statement. "What a pleasant surprise this morning when our flight operations team confirmed that NanoSail-D is now a free flyer." Engineers aren't sure yet if NanoSail-D, about the size of a loaf of bread, is operating. To find out, officials are asking for help from amateur radio operators, also known as “hams.” They want folks to listen for the little satellite's signal, which can be found at 437.270 MHz. Any information should be sent to the NanoSail-D dashboard, available by clicking here. "This is great news for our team. We're anxious to hear the beacon which tells us that NanoSail-D is healthy and operating as planned," said Dean Alhorn, NanoSail-D principal investigator and aerospace engineer at Marshall. "The science team is hopeful to see that NanoSail-D is operational and will be able to unfurl its solar sail." After ejection, a timer within NanoSail-D begins a three-day countdown as the satellite orbits the Earth. Once the timer reaches zero, four booms will deploy and the nanosatellite's sail will start to unfold. Within 5 seconds, it should unfurl into a 100-square-foot polymer sail. If deployment is successful, NanoSail-D will stay in low-Earth orbit between 70 and 120 days, depending on atmospheric conditions, officials said. On Dec. 6, 2010, NASA triggered the planned ejection of NanoSail-D from FASTSAT, which was carrying several other scientific payloads as well. At that time, the team confirmed that the door opened and data indicated a successful ejection. Upon further analysis, however, no evidence of NanoSail-D was identified in low-Earth orbit. So the team concluded that NanoSail-D likely remained inside FASTSAT, officials said. 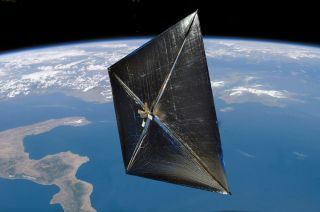 NanoSail-D is not the first spacecraft to attempt to demonstrate solar-sail technology. In June 2010, Japan's Ikaros probe deployed its solar sail, becoming the first craft to cruise through space propelled only by sunlight.